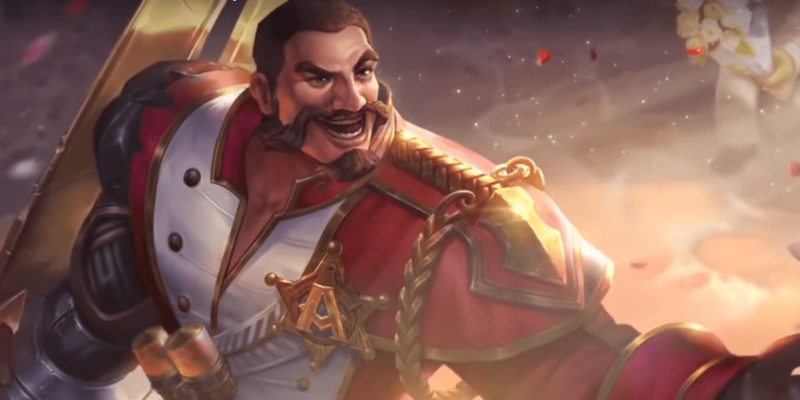 Guide for the hero Rourke, a character in Arena of Valor (AoV). Included are Rourke’s abilities, statistics, attributes, strengths, weaknesses, and more. Each bolt reduces target armor by 6 (+1 per level). Maximum armor reduction (level 15) is 20 * 12 = 240. The damage listed is for each bolt’s normal damage. 1 bolt deals 0.5 AD, 2 deal a combined 0.9, 3 deal a combined 1.3, and all 4 deal out 1.7 AD damage. Most abilities treat all of the bolts as a single attack. Scattershot’s armor shred is an exception, each bolt applying a stack. Spear of Longinus is an additional exception, applying two stacks per shot. Bolts will damage the first enemy they connect with without regard to Rourke’s target. While results will vary depending on the target’s size, Rourke will hit a hero with two bolts if attacking them at the edge of his range. This raies to three bolts at about 400 units and all four bolts at melee range of 200 units. This is all assuming that his shots are uninterrupted and made directly towards the target. Deals 100% damage to structures (based on attack damage). For 4 seconds, Rourke increases his movement speed by 40% and his next normal attack fires special bolts, each dealing 225 (+0.75 AD)ˀ physical damage. Reduces target movement speed if all 4 bolts hit the same enemy hero. Rourke dashes forward and stops when he runs into an enemy 180 (+0.7 AD)ˀ physical damage to the target and all nearby enemies, also stunning them and knocking them back. If he runs into an enemy hero, the cooldown of this ability is reduced by 2 seconds. Can not pass through walls. Rourke dispels all control effects on himself and gains a shield that absorbs 1200 damage. While the shield is active, Rourke is immune to control effects and converts 50% of damage dealt to additional shield value (20% for monster and minions). Shield value may not exceed 150% of its original Rourke also gains 50 attack damage and 120 armor for 6 seconds. Rourke maintains the attack damage and armor boosts if the shield is destroyed early. Rourke can no longer gain shield points by attacking after the shield is destroyed. To play Rourke well, you must decide whether to poke from afar or burst in melee range. Don’t forget that both of his abilities provide distance adjustments. Be careful to avoid focused fire from enemies after using Determination. Our recommended order for Rourke’s abilities as he levels up. See all of Rourke’s item builds. Needs urgent nerf. Not only his damage is insane, but that shield is the most unfair thing in life. Does Rourke still count as Marksman and benefits from marksman weapons’s passive such as bow of slaughter and Claves Sancti?